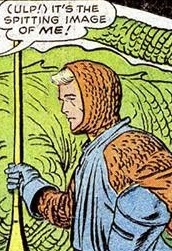 Powers/Abilities: "Ted Grey" was an ordinary man who walked through a mysterious fog and was temporarily transported back to the Age of Camelot. 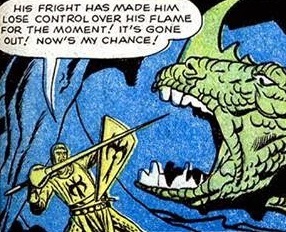 While in the past, "Grey" used the accoutrements of a knight (including scale-mail, a helmet, a sword, a shield, and a lance) along with a whistle, and he displayed great gallantry when he slew a dragon. 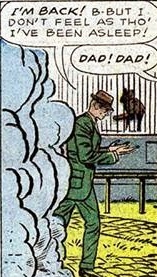 History: (Journey into Mystery I#81/2) - The past of "Ted Grey" is unrevealed, but one Sunday morning, he took his son Tommy to the zoo--although Tommy was excited about going, he insisted on taking along his storybook --When Knights Were Bold (see comments)--and his whistle. 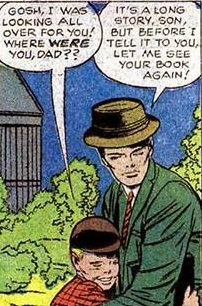 The father and his son were looking at the caged animals, but Tommy was more interested in his storybook because he thought none of the zoo animals were wilder than the animals in the book; "Ted" asked his son to show him what he meant, so Tommy had his father hold his whistle while he turned the storybook's pages and showed "Ted" a picture of a knight standing over a slain dragon. After giving the illustration a cursory glance, "Ted" told his son that dragons weren't real, only legends made up by superstitious people. 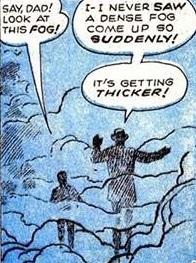 As the father and son continued walking through the zoo, they came upon a sudden swirling bank of fog. "Ted" lost track of Tommy as the mist got thicker and thicker, then he came to a clearing when the fog thinned; but "Grey" found that the zoo--even the whole city--had disappeared, for where once there had been skyscrapers and streets, there was now fields and mountains! "Ted" continued to walk and came upon the outskirts of a medieval castle, where he saw knights on horseback. "Grey" asked one of the knights where he was, and learned he had somehow been transported back in time to legendary Camelot! Thinking he had merely fallen asleep, "Ted" was convinced he was dreaming. He came upon some wounded knights gathered around the mouth of a cave, and he learned there was a dragon within. Still holding Tommy's whistle (which he thought might come in handy), "Grey" volunteered to slay the dragon, so he borrowed armor and a lance from one of the knights--supposing it was just a dream, "Grey" figured the worst that could happen was that he'd wake up just before the dragon grabbed him. But as he entered the dank and dark cave, "Grey" could feel his confidence slipping away when there came a horrifying roar and a huge burst of flame, then he stood face-to-face with the monster. He removed his helmet and blew the whistle, and the shrill sound reverberated from the cave walls; the startled dragon drew back from the harsh blare which pained its ears, unable to use its flames. "Grey" then raised his lance and hurled it at the dragon, slaying the monster. With the dragon dead, "Grey" returned the armor to the knights and received a reward for his noble deed--a sack containing twenty gold nuggets. Still convinced he was dreaming, "Grey" decided that if he couldn't wake himself up by fighting a dragon, maybe he could do so by walking back through the fog. "Grey" returned to the fog bank, and as he walked through it, he noticed the sack of gold disappearing. He continued on until he emerged out of the fog, finding himself back at the zoo. Tommy came running up and gave his father a hug, relieved to see him again. "Ted" asked Tommy to show him the storybook picture with the knight and dragon again--this time "Ted" took a closer look at the illustration, and he saw that the knight's face was identical to his own! 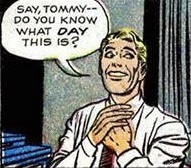 This character was never identified in the story (Tommy only called him "Dad") so I took the liberty of giving him a name -- I named him in honor of Jack Kirby, and used one of Kirby's earlier pseudonyms. There have been other instances when a mysterious fog transported people through time (e.g. Dan Cooper, "Monster in the Mist"), but considering "Ted Grey's" destination, maybe Merlin had something to do with this particular fog. 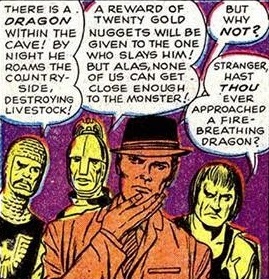 This issue of Journey into Mystery was published after Fantastic Four I#4, so it's possible that this story took place in the early days of the modern-era Marvel Universe. 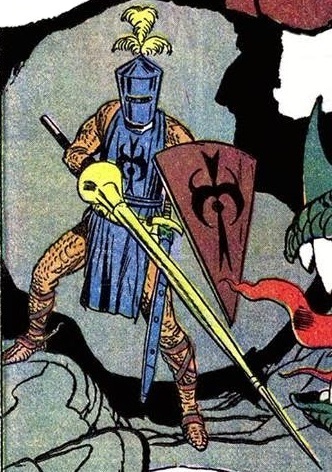 Also, Fantastic Four I#17 depicted a man in an armored costume (whom the Thing briefly mistook for Doctor Doom) who was advertising a movie called When Knights Were Bold, the same title as Tommy's storybook -- maybe Tommy's book was a merchandising tie-in for that film. 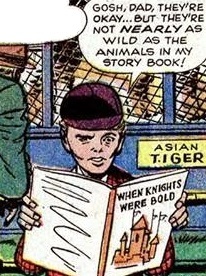 The son of "Ted Grey," he was excited when his father took him on a trip to the zoo one Sunday morning; but Tommy still insisted on bringing along his storybook, When Knights Were Bold, and his whistle. During the zoo visit, Tommy was more interested in his book than in the zoo animals. His father wondered what he found so fascinating, so Tommy asked him to hold his whistle while he turned the book's pages; then Tommy showed "Ted" a picture of a knight and a slain dragon, and "Ted" told him that dragons weren't real. While Tommy accompanied his father as they continued their walk through the zoo, they stepped into a strange fog bank and became separated--unknown to Tommy, his father had been transported through time to Camelot. Shortly thereafter, Tommy saw his father emerge from the fog After his adventure slaying a dragon himself, "Ted" told Tommy that maybe he spoke too soon when he said there were no such things as dragons, because anything was possible; Tommy assured his father that he wasn't scared ("I'll bet if there are any dragons, you can lick 'em, Dad!"). None identified, they were a group of knights in 6th Century England. The knights were gathered around the mouth of a cave, where dwelt a menacing dragon they were trying to slay. 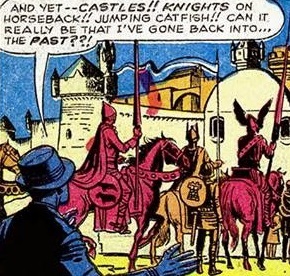 But the knights were unsuccessful, and they had been wounded by the creature; then they met "Ted Grey," who had been transported back through time. 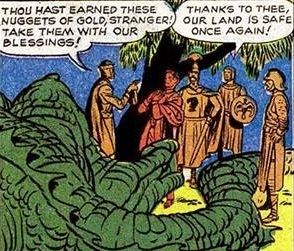 They loaned "Grey" armor and weapons, and after he killed the dragon, they gave "Grey" a reward for the deed--a sack containing twenty gold nuggets. A large fire-breathing monster, it dwelt in a cave near Camelot in the 6th Century; it menaced the area when it roamed the countryside and destroyed livestock. Some of the knights of Camelot attempted to slay it, but they were unsuccessful and were left wounded by the monster. 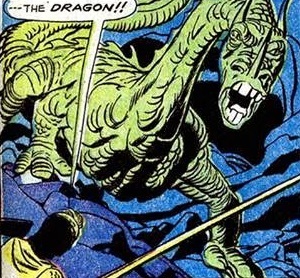 But the dragon met its match when it faced"Ted Grey," who had been transported from modern times. 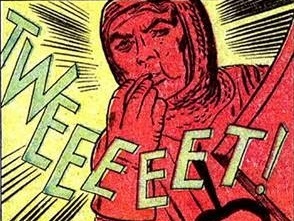 When the dragon blew flames at him, "Grey" blew a whistle, and the shrill blare of it was painful to the monster's ears. The startled dragon was momentarily unable to utilize it fiery breath, which gave "Grey" the chance to kill it with his lance. A mysterious mist, it somehow transported "Ted Grey" through time and space, taking him from a modern-day American zoo to 6th Century England. After slaying a dragon, "Grey" walked back through the fog and returned to his own time. 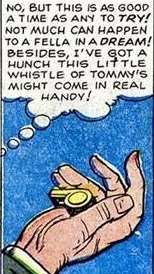 A toy whistle owned by "Ted Grey's" son, Tommy handed it over to his father to hold for him while he turned the pages of his storybook. 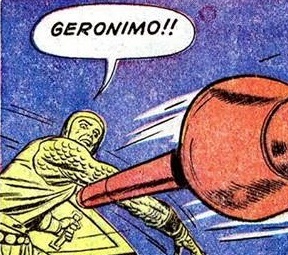 "Ted Grey" was still holding the whistle when he was transported through time and space to Camelot; it later proved useful when he confronted a dragon. "Grey" blew the whistle, and its shrill blare pained the dragon's ears and rendered it incapable of using its flames, which gave him the opportunity to slay the monster. 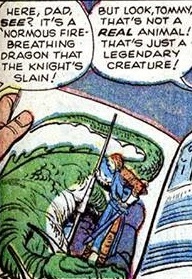 One of the illustrations in Tommy's storybook, When Knights Were Bold, it depicted a knight standing over a slain dragon. 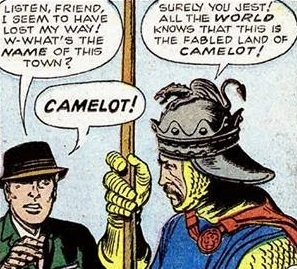 "Ted Grey" took a cursory glance at the picture before he was transported back in time to Camelot. After "Grey" slew a dragon and returned to his own time, he took a closer look at the illustration and saw that the face of the knight was identical to his own.